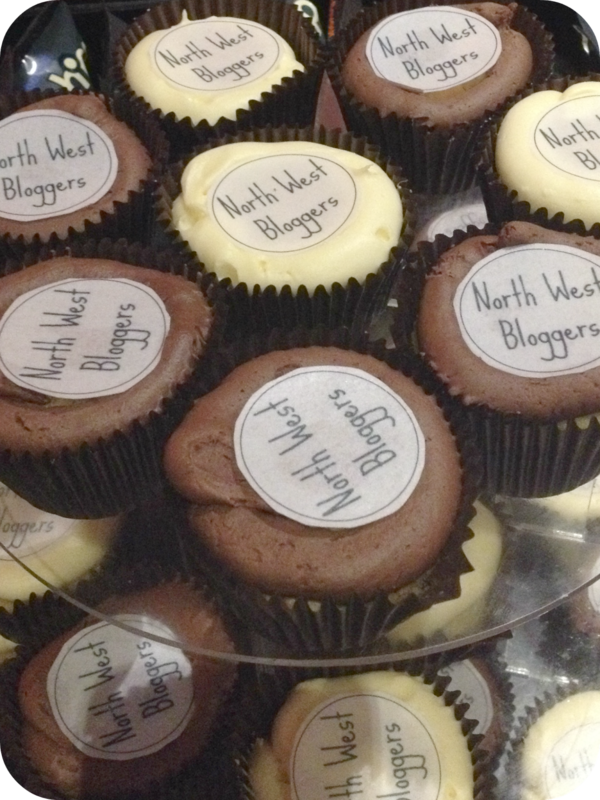 This past Sunday I was lucky enough to be invited along to the first ever North West Bloggers Event in Liverpool! 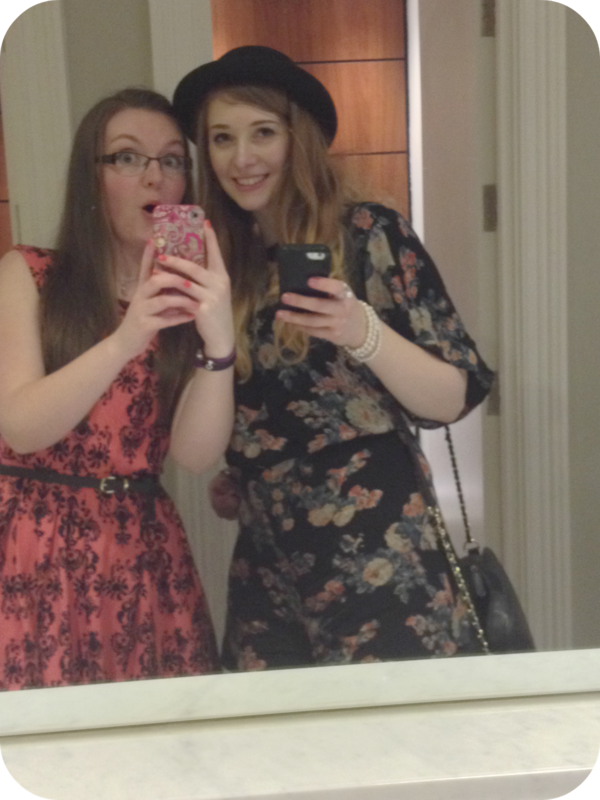 The event was put together by the wonderful Hannah Rosalie! As far as I'm aware, nothing like this has been put together before, so to be a part of the first one was something pretty special for me - it also made this whole blogging thing feel...real! The event was held in Hari's Bar in the Hard Days Night Hotel. Talk about setting the bar high! 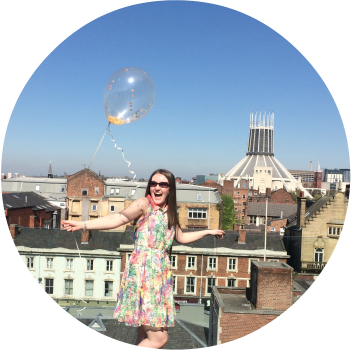 I couldn't believe it when the venue was announced, I mean that place has fast become one of the most popular and iconic hotels in the city (it involves The Beatles, everything is big in Liverpool if it has The Beatles on!). It was fantastic walking through those huge glass doors and heading into the event! Very swanky! Hari's Bar is so plush, all dark woods and reds, it's a little on the small side but very cosy! There was some fantastic Beatles photography on the walls too that I'd never seen before. A side table of scrumptious snacks had been put on for us too, thanks to the wonderful people at Krispy Kreme, PopChips and Jelly Belly...I won't lie, I stuffed my face throughout the afternoon, it would have been rude not too! Let me just jump right in here and say I was extremely NERVOUS the whole morning leading up to the event! See, apart from my wonderful Ginger Jaxx, blogging has pretty much been a solo-venture for me. Sure, I've talked to friends and family about it, but not a lot of them really get what this whole blogging thing is about. 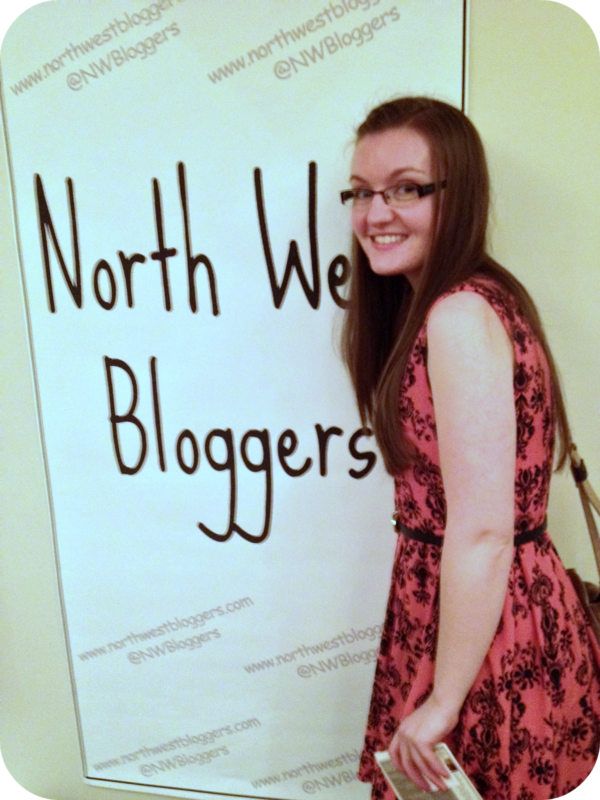 Heading to spend an afternoon with a room full of bloggers was so intimidating! There where so many amazing bloggers there, bloggers who I'd been reading for an age where going to be in the same room as me! For a little blogger like myself - well I felt pretty insignificant and star struck! The weeks leading up to the event I'd started getting to know quite a few of the bloggers attending which was fantastic, it made it a little less scary...but trying to match Twitter names to faces in real life....oh wow, you have no idea how hard that is - it's twice as hard when you're nervous too! I was so worried I would get people mixed up or their names wrong, yes, that makes introductions a little difficult but then the most amazingly bizzare thing happened...people came up to me knowing who I was! People who had tweeted me, read my blog, and wanted to say hi...it was amazing! I started to feel like a blogger...a blogger who actually had a little audience and wasn't just rambling to herself on the internet! After meeting, greeting and some mingling (and maybe a vodka & soda) a set of double doors in the bar opened up and we where let loose in the function room. Having never attended an event like this before I had no idea what to expect - I would liken it to a freshers fair when you first start uni. Lots of stalls, lots of information and lots of very friendly, happy, chatty folk. The first stall I headed to was Tear Drop Designs. I'd seen their beautiful hand-crafted jewerrly over on the Asos marketplace and had had my eye on a few pretty pieces - pretty much anything that involved a bird! I picked up this gorgeous open cage and free bird necklace for just £7.20 - they gave us a very generous 10% discount on anything we bought at the event, I'm wishing I'd picked up a few more pieces now! I also picked up a make a wish bracelet. It's a simple black cotton band with a cutest little star charm dangling from it. Next up...Lush...*happy dances*, whoops, ignore the dance moves! Seriously, they had the best table! Lush is like my second home at the minute, so much of my wage goes into the store I feel like they should give me a share or something! 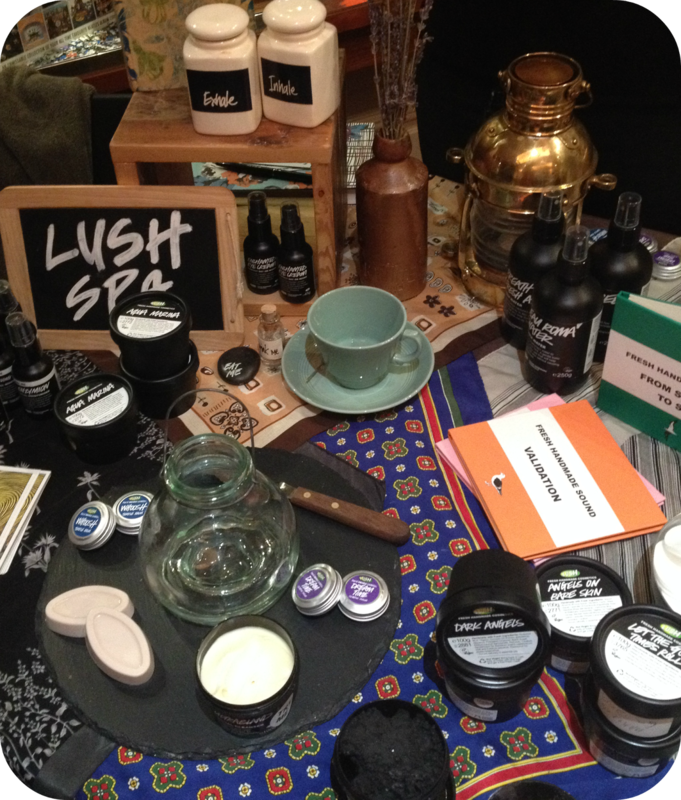 The table was filled with some of their best products, from bath bombs, to face wash and lip scrubs. They also had someone on hand to give little mini facials too! 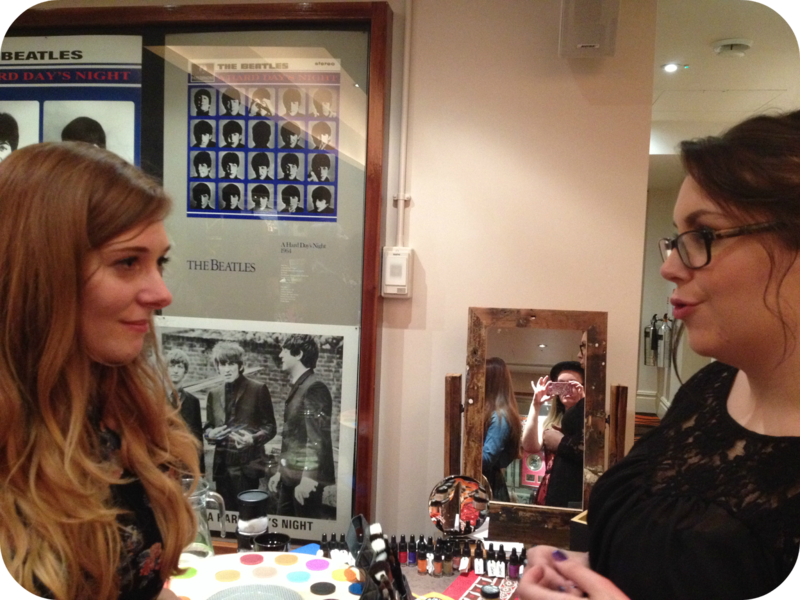 AND, as if we hadn't been spoilt enough...Jen Hunter was on hand for make up tips, tricks and general chatter (and she loves a good chin wag, we where talking for an absolute age - shes so lovely and such a talented lady!). She's also the 2014 Makeup Specialist of the Year Winner! I don't know about you but I know next to nothing about the make-up line in Lush - so to have this all explained and showcased to me on such a personal basis was amazing! Jen explained the lip stains and liners to me, all of the wonderful skin loving natural ingredients inside and how the products themselves are so multi-functional! Let's not forget the little potion bottles look so darn cute too! Also at the even was a beautiful jewerrly range from Fashion Zoo, and representatives from both St Moriz and Skinetica. I didn't get to spend much time at these tables as I was with the Lush girls for ages and running about mingling and getting to know the other bloggers! Jaxx and I also had some fun in the photo-booth (who can walk past a photo booth with props and not have a go?? It's impossible! 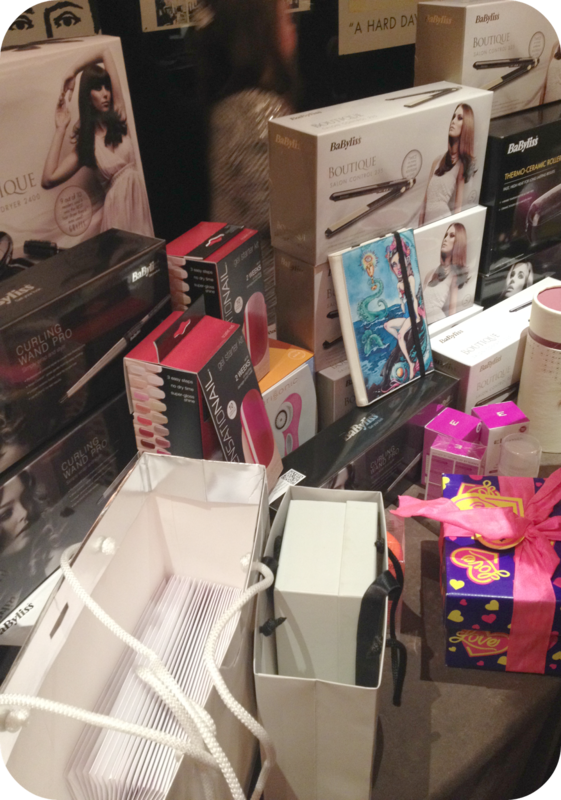 This isn't even HALF of what the raffle table had on offer! Now, a big ol' paragraph of a mention has to go to the raffle table. Hannah had enlisted her adorable aunt to help sell raffle tickets - and after seeing the prizes on offer you couldn't not buy a strip or two or three! 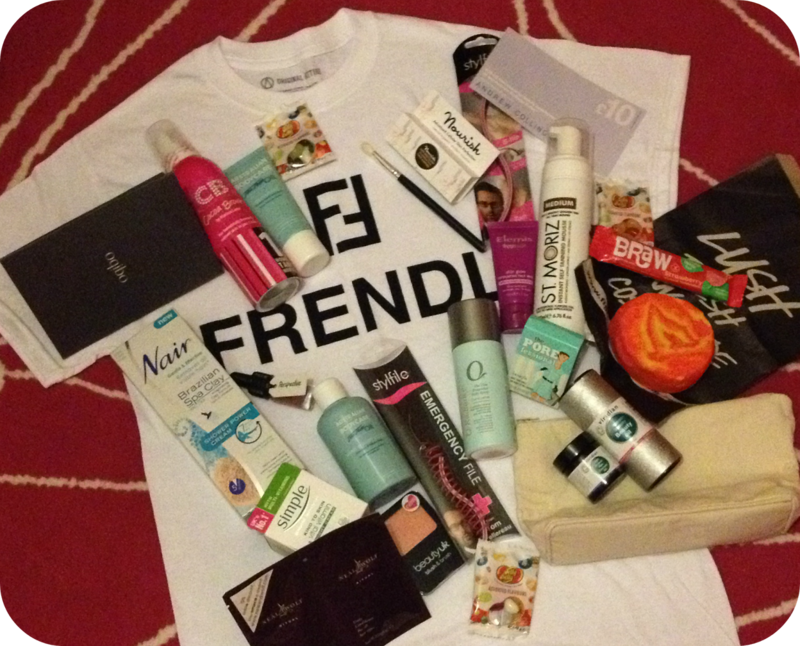 Elemis, Neal & Wolf, BaByliss, Clarisonic, Tangle Teezer, Inodorem, SensatioNail, Lelli kelly and Caseable are just some of the amazing companies who sent in a truck load of goodies for the raffle prizes (and goodie bags, but more on that later). Everyone was in awe when they caught a glimpse of the prize table - I couldn't believe how generous everyone had been - THANK YOU! Raffle winners where announced over Twitter - and you can imagine just how excited I was when I got a winners tweet! I rushed over to the table to claim my prize...BaByliss Curling Wand Pro!! *happy dance* I've been coveting one of these for so long, it was fate that I won it I'm sure! So many awesome goodies where won throughout the afternoon and everyone had a beaming smile on their faces coming away with their prizes! Now, everyone always wants to know about the goodie bags, let's face it, we all love a good freebie - and wow, where we in for a treat! These goodie bags weighed an absolute tonne! They where all filled to the brim with goodies from the likes of; Original Attire, Nair, Simple, Elemis, Lush, Sylefile, Australian Bodycare, St Moriz, and Crown Brush to name but a few! I never expected to take away so many goodies and I can't wait to start trying them out! The whole afternoon was an absolute pleasure. I got to meet up with some amazing bloggers and spent the day talking all about blogging and beauty and lifestyle with like-minded individuals. There was a great sense of community there that day, a whole bunch of girls brought together by their online endeavors and love for beauty and life. 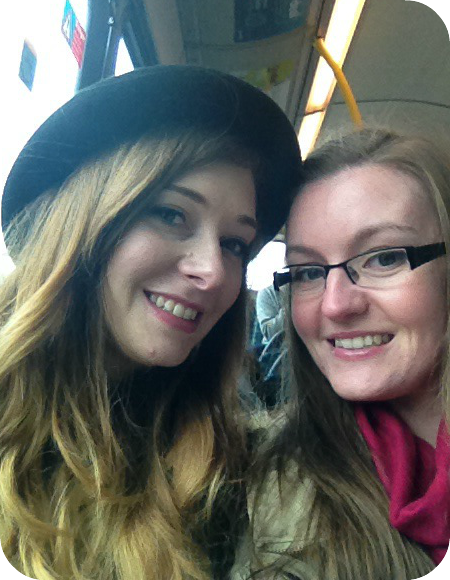 It was brilliant to finally put faces and voices to twitter names and meet the beauties behind the blogs! There's already talk of a second event this year so you can guarantee I'll be making every effort to get to it! Have you ever attended a bloggers event? I'm so jealous of you! I kept seeing about this on Twitter but I was working and also not very close to Liverpool! Hopefully they'll be one closer to me soon! Hoping for another event near Summer, hoping you can make that one! It was such a great day, so many amazing bloggers all under one roof! Thanks so much lovely! It was tons of fun, I can't wait for my next event! We had our wedding at this place last month and it could not have been any more perfect. I absolutely love this place! Their chef and event coordinators all were amazing. I can imagine it being a perfect place for that kind of event! It's a stunning venue, I'd love to spend more time there!